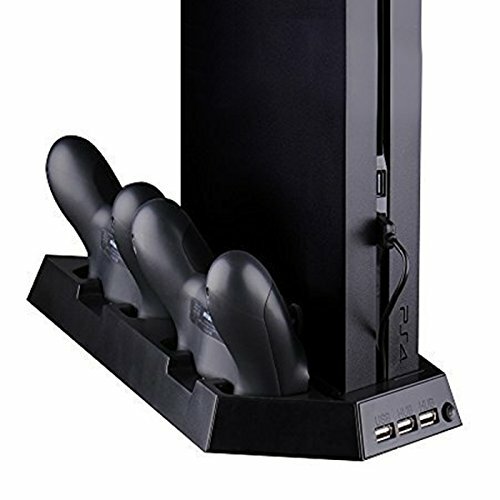 Fully equipped with three USB ports for additional charging, two powerful cooling fans, and a solid base designed to be sturdy; this 3 -in-1 PS4 vertical charging station stand proves its value through its practicality. Providing clean, consistent airflow helps mitigate dust build-up which boosts overall console vitality. Your Playstation and controllers will fit securely in a vertical position while doing away with excess wires and clutter. This 3-in-1 stand is the ultimate accessory for all PS4 enthusiasts.